Elaeagnus is an evergreen with leathery leaves that are glossy dark green on upper sides then silvery beneath, giving a nice contrast. Elaeagnus is sometimes called Ugly-Agnes because of its wild growth habit, but this shrub can look nice if sheared properly. 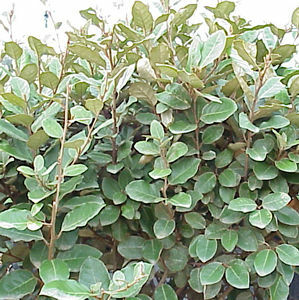 Elaeagnus is known for its toughness, it can survive and thrive in places many shrubs cannot, such as highway medians. Elaeagnus x ebbingei is a hybrid from E. pungens. E. x ebbingei is more upright in growth an has no thorns on the branches. This shrub has tiny, fragrant, white flowers and the fruit is sometimes used to make jelly. It can grow to be up to 10-12 feet tall.